The Canton of Graubünden or Grisons (German: , Italian: Romansh: see also other names) is the largest and easternmost canton of Switzerland. The canton shares borders with the cantons of Ticino, Uri, Glarus and St. Gallen and international borders with Italy, Austria and Liechtenstein. 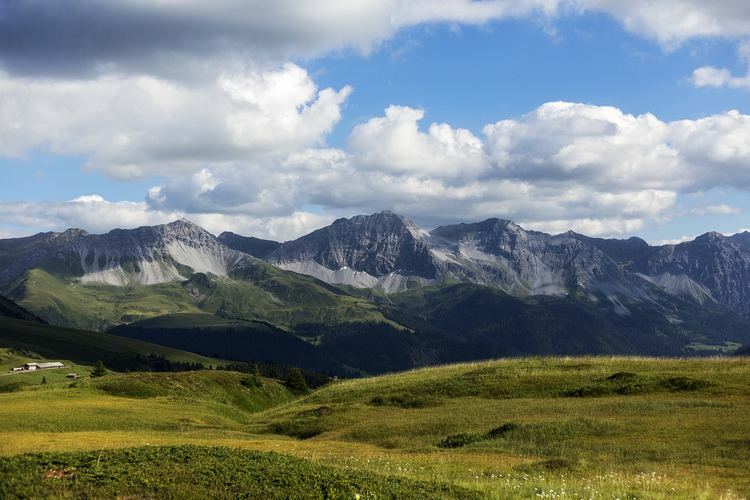 The name Graubünden translates as the "Grey Leagues," referring to the cantons origin in three local alliances, the League of Gods House, the Grey League, and the League of Ten Jurisdictions. Graubünden is also home to three of Switzerlands ethnic groups and the subsequent languages of Swiss German, Italian and Romansh are all native to the state. It is the only officially trilingual canton and the only canton where the Romansh language has official status. Graubünden is by far Switzerlands largest canton at 7,105.2 square kilometres (2,743.3 sq mi). Only about a third of this is commonly regarded as productive land of which forests cover about a fifth of the total area. The canton is entirely mountainous, comprising the highlands of the Rhine and Inn river valleys. 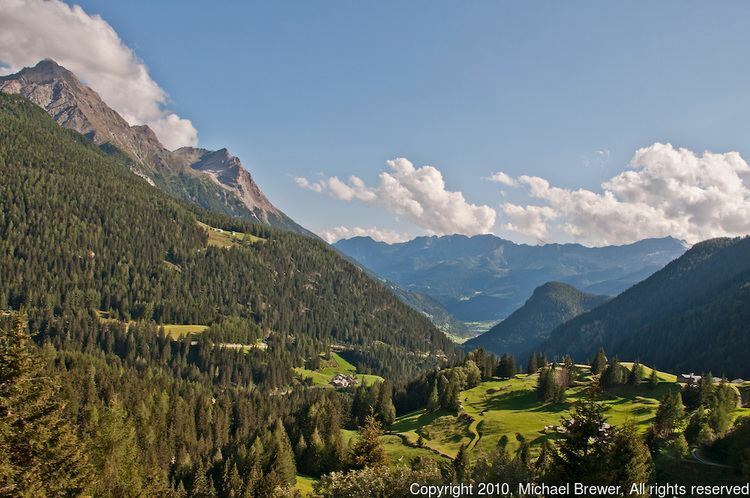 In its southeastern part lies the only official Swiss National Park. In its northern part the mountains were formed as part of the thrust fault that was declared a geologic UNESCO World Heritage Site, under the name Swiss Tectonic Arena Sardona, in 2008. Another Biosphere Reserve is the Biosfera Val Müstair adjacent to the Swiss National Park whereas Ela Nature Park is one of the regionally supported parks. There are many significant elevations in the Grison Alps, including the Tödi at 3,614 metres (11,857 ft) and the highest peak Piz Bernina at 4,049 metres (13,284 ft). Many of the mountain ranges feature extensive glaciers, such as at the Adula, the Albula, the Silvretta, the Bernina, the Bregaglia and the Rätikon ranges. The mountain ranges in the central area are very deep, some of which are considered the deepest valleys in Europe. These valleys were originally settled by the Raetians (Rhaeti). Graubünden borders on the cantons of St. Gallen to the northwest, Glarus, Uri to the west, and Ticino to the southwest. It also shares international borders with Italy (South Tyrol and Lombardy), Austria (Tyrol and Vorarlberg) and Liechtenstein. The capital city is Chur. The world-famous resorts of St. Moritz and Davos-Klosters are located in the canton, completed by the larger all year round tourism destinations of Arosa, Flims, Lenzerheide, Scuol-Sammnaun and more. The inhabitants of Grisons are called Bündner or (rarely) Grisonians. Most of the lands of the canton were once part of a Roman province called Raetia which was established in 15 BC. The current capital of Graubünden, Chur, was known as Curia in Roman times. The area later was part of the lands of the diocese at Chur. In 1367 the League of Gods House (Cadi, Gottes Haus, Ca di Dio) was founded to resist the rising power of the Bishop of Chur. This was followed by the establishment of the Grey League (Grauer Bund), sometimes called Oberbund, in 1395 in the Upper Rhine valley. The name Grey League is derived from the homespun grey clothes worn by the people and was used exclusively after 16 March 1424. The name of this league later gave its name to the canton of Graubünden. A third league was established in 1436 by the people of ten bailiwicks in the former Toggenburg countship, as the dynasty of Toggenburg had become extinct. The league was called League of the Ten Jurisdictions (Zehngerichtebund). The first step towards the canton of Graubünden was when the league of the Ten Jurisdictions allied with the League of Gods House in 1450. In 1471 the two leagues allied with the Grey League. In 1497 and 1498 the Leagues allied with the Old Swiss Confederacy after the Habsburgs acquired the possessions of the extinct Toggenburg dynasty in 1496, siding with the Confederacy in the Swabian War three years later. The Habsburgs were defeated at Calven Gorge and Dornach, helping the Swiss Confederation and the allied leagues of the canton of Grisons to be recognised. However the Three Leagues remained a loose association until the Bundesbrief of 23 September 1524. The last traces of the Bishop of Churs jurisdiction were abolished in 1526. The Musso war of 1520 drove the Three Leagues closer to the Swiss Confederacy. Between 1618 and 1639 it became a battleground between competing factions during the Bündner Wirren. The Protestant party was supported by France and Venice, while the Catholic party was supported by the Habsburgs in Spain and Austria. Each side sought to gain control of the Graubünden to gain control over the important alpine passes. In 1618, the young radical Jörg Jenatsch became a member of the court of clerical overseers and a leader of the anti-Habsburg faction. He supervised the torture to death of the arch-priest Nicola Rusca of Sondrio. In response, Giacomo Robustelli of the pro-Catholic Planta family, raised an army of rebels in the Valtellina. On the evening of 18/19 July 1620, a force of Valtellina rebels supported by Austrian and Italian troops marched into Tirano and began killing Protestants. When they finished in Tirano, they marched to Teglio, Sondrio and further down the valley killing every Protestant that they found. Between 500 and 600 people were killed on that night and in the following four days. The attack drove nearly all the Protestants out of the valley, prevented further Protestant incursions and took the Valtellina out of the Three Leagues. In response, in February 1621, Jenatsch led a force of anti-Habsburg troops to attack Rietberg Castle, the home of a leader of the pro-Catholic faction, Pompeius Planta. They surprised Planta and according to legend he was killed by Jörg Jenatsch with an axe. The murder of Planta encouraged the Protestant faction and they assembled a poorly led and disorganized army to retake the Valtellina and other subject lands. However, the army fell apart before they could attack a single Catholic town. This Protestant invasion provided the Spanish and Austrians an excuse to invade the Leagues. By the end of October, Spain and Austria had occupied all of Graubünden. The resulting peace treaty of January 1622, forced Graubünden to cede the Müstair, the Lower Engadine and Prättigau valleys. The treaty also forbade the Protestant religion in these valleys. In response, in 1622, the Prättigau valley rebelled against the Austrians and drove them out of the valley. The Austrians invaded the valley twice more, attempting to reimpose the Catholic faith, in 1623–24 and 1629–31. In 1623 the Leagues entered into an alliance with France, Savoy and Venice. Jürg Jenatsch and Ulysses von Salis used French money to hire an 8,000-man mercenary army and drive out the Austrians. The peace treaty of Monzon (5 March 1626) between France and Spain, confirmed the political and religious independence of the Valtellina. In 1627 the French withdrew from the Valtellina valley, which was then occupied by Papal troops. Starting in 1631 the League, under the French Duke Henri de Rohan, started to expel the Spaniards. However, Richelieu still did not want to hand the valley over to its residents. When it became clear that the French intended to remain permanently in the Leagues, but would not force the Valtellina to convert to Protestantism, Jürg Jenatsch (now a mercenary leader) converted in 1635 to the Catholic faith. In 1637, he rebelled and allied with Austria and Spain. His rebellion along with the rebellion of 31 other League officers forced the French to withdraw without a fight. On 24 January 1639, Jürg Jenatsch was killed during Carnival by an unknown attacker who was dressed as a bear. The attacker may have been a son of Pompeius Planta or an assassin hired by the local aristocracy. According to legend he was killed by the same axe that he used on Pompeius Planta. On 3 September 1639 the Leagues agreed with Spain to bring the Valtellina back under League sovereignty, but with the promise to respect the free exercise of the Catholic faith. Treaties with Austria in 1649 and 1652, brought the Müstair and Lower Engadine valleys back under the authority of the Three Leagues. In 1798, the lands of the canton of Graubünden became part of the Helvetic Republic as the Canton of Raetia except Valtellina, which was separated in 1797 for joining to the Cisalpine Republic. It was later part of Empire of Austria in 1814 before joining to Kingdom of Italy in 1859. With the Act of Mediation the "perpetual ally" of Switzerland became a canton in 1803. The constitution of the canton dates from 1892. In the following century, there have been about 30 changes made to the constitution. The arms of the three original leagues are were combined into the modern cantonal coat of arms in 1933. The canton is known as a region with a high density of medieval castles (and ruins) for example in the Domleschg area. Close by lies the church of Zillis, where 1130/40 a famous romanesque illustrated ceiling was added which is now treated as national heritage. Three World Heritage Sites are located in the canton: the Benedictine Convent of Saint John, the Swiss Tectonic Arena Sardona and the Rhaetian Railway in the Albula and Bernina Landscapes. The Graubünden are known for a dried-beef delicacy called Bündnerfleisch and for a nut and honey pie known as Bündner Nusstorte. Another specialty, predominantly made in the western part of Grison, are Capuns, hearty dumplings with pieces of meat wrapped in chard leaves. The Raetia national football team, a member of the NF-Board, represents the region at international level, and competed in the 2012 VIVA World Cup.